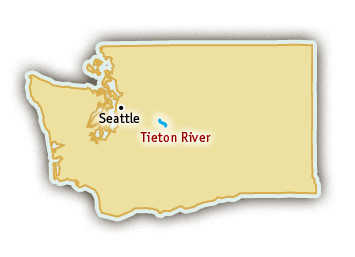 The Tieton drains a relatively small watershed on the east slope of the Cascades south of Mt. Rainier. Its upper reaches are flooded by reservoirs, and below Tieton Dam the river flows eastward for only 20 miles before joining the Naches River west of Yakima. The high Cascade crest to the west produces a strong rain shadow that accounts for the Tieton’s generally sunny summer weather. Blue Sky Outfitters is one of the oldest and most respected whitewater rafting outfitters in Washington State. 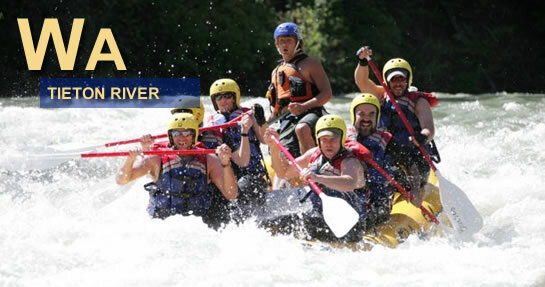 They have been providing top quality rafting trips in the Pacific Northwest for more than 27 years. Visit their website for more information about Tieton River Rafting. The Tieton River offers non-stop whitewater action with challenging rapids such as Wild Rose, High Noon, and the unforgettable Waffle Wall. Although no individual rapid it rated Class V, The Tieton River is one of the steepest raftable rivers in Washington, dropping nearly 600 feet from put-in to take-out. Most of the riverside land is National Forest; as a result the Tieton offers more undeveloped forest scenery than other popular east-slope river. The scenic canyon is lightly forested near the beginning of the run and becomes drier and brushier toward the end. For most of the year, Washington whitewater rafting enthusiasts neglect the Tieton River. But come September, a time when most other Washington rivers have been reduced to a trickle, the Bureau of Reclamation releases irrigation water stored behind Tieton Dam.